SUPER-CUT diamond tooling products deliver superior grinding and cutting performance in demanding thin glass processing applications, from ultra-thin glass for consumer electronics (phones, tablets, laptops and wearable devices) to optical components. SUPER-CUT’s total system solutions include cutting tools, grinding wheels and lubricants specially designed to meet the unique edge quality and startup challenges of thin glass fabrication. While the rising demand for thin glass offers incredible potential and new applications, thin glass is extremely challenging to fabricate. Precise cutting and grinding is required to ensure a high-quality edge while avoiding breakage. SUPER-CUT’s high-performance wheels and drills are engineered for consistent and reliable results in challenging glass grinding applications in glass thicknesses of 0.5 mm, 0.7 mm, 1.1 mm and 1.5 mm. We also offer a full line of glass grinding coolants, including a new synthetic coolant with outstanding lubricity, to increase tooling life for thin glass processing. Contact your SUPER-CUT sales engineer to learn about our complete range of solutions for thin glass fabrication. SUPER-CUT carbide and diamond finish cutting wheels are designed to create a clean and defined score of the glass. TIP: When using a 3.0 mm OD cutting wheel, it must be used with the correct post for the best cutting response and fit. The height is adjusted in the post, so you won’t need to adjust the height on your cutting bridge. For example, on a Bystronic cutter, the correct post is 66260169007. For thin glass operations, SUPER-CUT offers dependable, low-cost carbide cutting wheels. SUPER-CUT carbide cutting wheels are available pre-assembled or as separate components. Our pre-assembled wheel, axle and insert save valuable line operator assembly time, increasing your productivity. Also available and matched to the cutting wheel, SUPER-CUT posts allow our cutting wheels to fit any cutting machine on the market. See below for information on SUPER-CUT Coolants. 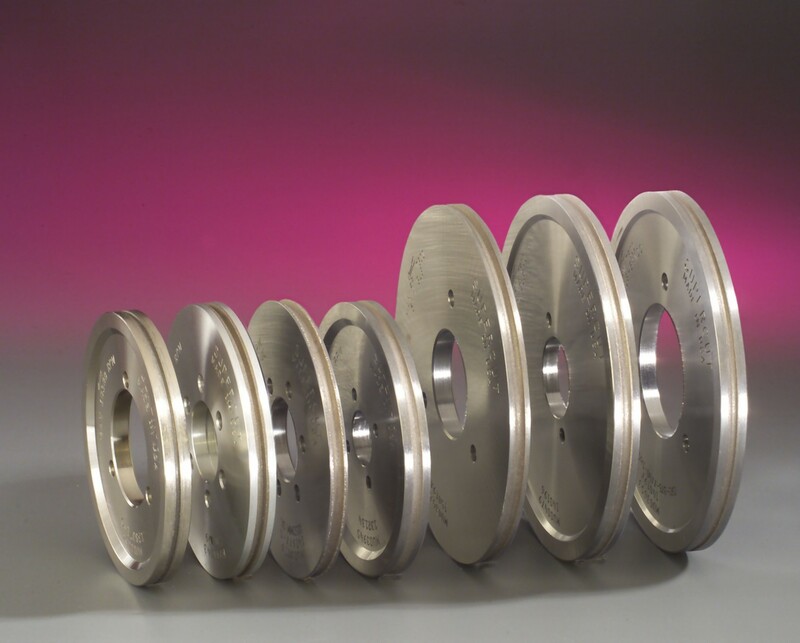 SUPER-CUT diamond pencil edging wheels are engineered to your needs. Our diamond/bond specification meets the extremely high edge requirements for thin glass. You’ll get a ground edge so smooth and chip-free that it will even pass the microscope exam. Thin glass requires special handling and a special profile with multiple radius, blended to a complex shape. SUPER-CUT EDM profiles will give you the exact shape you design. Let us design the profile that’s perfect for your application. SUPER-CUT diamond and metal bonds have the best wear rates in the industry. Our bonds hold the profile shape, improving tempering yields. Increase the number of redress in each wheel and lower your cost significantly. SUPER-CUT manufactures pencil edging wheels for all straight line machines, double edgers, CAM or CNC grinders. We can design a custom OD exactly for your equipment and grinding needs with wheel OD as small as 25 mm and no restrictions on the OD of the grinding wheel. SUPER-CUT diamond drills allow for rapid penetration of the glass surface and improved hole quality. While it is not recommended to drill thin glass, SUPER-CUT drills can drill the hole if necessary prior to chemically strengthening the glass. Routers and seamers are also available. Our one-piece straight core drills offer fast performance and amazing life, in sizes from 4 mm to 180 mm OD. SUPER-CUT has developed specifications especially for drilling thin glass. Shank design will be selected to fit your equipment. SUPER-CUT’s one-piece chamfer drills are designed to drill and chamfer holes in a single cycle. The fixed core lengths are set for each glass thickness to provide optimum drill speed and hole quality. The one-piece core drill seamer is the most commonly used drill in glass today due to its ease of use and excellent hole quality, resulting in high glass yields in the tempering process. Consult a SUPER-CUT sales engineer for a size and specification recommendation. TIP: Due to the fragile nature of the raw thin glass, we recommend drilling with the appropriate coolant. Ask your SUPER-CUT engineer for a recommendation. SUPER-CUT dressing sticks are used on diamond tools to sharpen or re-expose diamonds and optimize glass edge quality and tool feed speed. Proper wheel and drill dressing will reduce chipping and eliminate breakage and burns during glass fabrication. We offer a line of dressing sticks specially designed for thin glass applications. A relatively softer abrasive is used to provide greater diamond exposure. The SUPER-CUT Advantage: Highly friable grains allow quick and consistent re-sharpening, lower diamond wear, and longer tool life. Cutting oil is used to score glass for breakout. The oil fills the score and prevents the glass from re-healing, allowing a clean, defect-free separation of the glass part from the cullet trim. Years of R&D development have generated significant new synthetic coolant products for glass operations. Coolant is designed as a one-part system used primarily in centrifuge systems, or a two-part system with a secondary flocculant additive for settling systems.